One of my all time favorite novels is “1984” by George Orwell. It was particularly fascinating to me back in the late ‘50s or early 60s when I first read it. The direct parallels with today’s politics are equally bewitching. When I first encountered the book, it was for the pleasure of reading pure fiction. I did, however, at the time and oft thereafter question, “What if?”. Over the decades, I have seen many comparisons to the work. Today the book reads more like an honest news account than most of what the broadcast or print media offers. Orwell had other sage and salient quotes to his credit. Following are just a few. Ignorance Is Strength.” Have you ever noticed how ignorant people have a great deal of strength in their convictions?” George Orwell. Liberals, in particular, tend to get loud and call names when their arguments lack merit. What they know inherently is all they need to know and there is little chance of enlightening them with facts or reason. Our public schools do a lot to reinforce this inability. Have you been called a racist yet because your take on right and wrong varies from that of our current administration and their subject lemmings? If you don’t accept that it is Bush’s fault, then you simply cannot stand to have a man of color in the White House. Certainly, these can be the only reasons for not accepting the fundamental change of the nation promised by this president. Being called a racist is much like the accusing question, “Have you been caught cheating on your spouse yet?” There is no right answer. “Newspeak was the official language … The purpose of Newspeak was not only to provide a medium of expression for the world-view and mental habits … but to make all other modes of thought impossible. It was intended that when Newspeak had been adopted once and for all and Oldspeak forgotten, a heretical thought should be literally unthinkable.” George Orwell. According to Janet Napolitano, former Sec. DHS, there is no radical Islam or extreme Muslim terrorists. There are only “man-caused disasters” or “overseas contingencies” to which we might send troops. She also expressed an equal or greater fear about our combat trained military and cautioned law enforcement to be aware of patriotism displays such as flags, bumper stickers, tattoos, etc. Orwell’s Newspeak of yesteryear is today’s Political Correctness. If you speak with definition, someone will claim to be offended and attach an indefensible label to you as a person. Then, they will seek a safe space in which to cower and hide from any reason and truth. Colleges today offer just such spaces so that those trained to be easily offended might sequester themselves from reality. The second offering is synthetic pharmaceuticals to mellow the fragile minds and allow only happy Utopian thoughts. Can you say Fast and Furious, Benghazi, NSA spying on virtually all Americans and many foreign leaders without warrant or reason, the IRS filtering availability of NPO status to almost all right leaning applicants thus limiting their fund raising ability in 2012. Can you imagine a potential voting block that would accept, dismiss or defend the treasonous deleting of public records such as classified email? 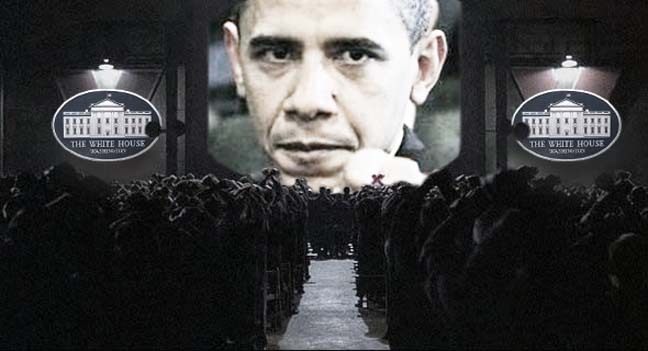 To Orwell, today’s nationalist is the defender of Obamacare, NSA domestic spying, IRS partisanship, the Eric Holder and now the Loretta Lynch and the Department of Selective Justice. “Barack knows that we are going to have to make sacrifices; we are going to have to change our conversation; we’re going to have to change our traditions, our history; we’re going to have to move into a different place as a nation.” Michelle Obama, May 14, 2008 San Juan, Puerto Rico The identical thought simply different wording. What more need be said? “I can make a firm pledge. Under my plan, no family making less than $250,000 a year will see any form of tax increase. Not your income tax, not your payroll tax, not your capital gains taxes, not any of your taxes.” Barack Obama – Dover NH, Sept 12, 2008 Um, uh, yeah well there is that Obamacare thing that affects every American working or not, even those on Medicare, Medicaid and Welfare. His lawyers declared it a tax, the Supreme Court gave them the power to use it as a tax and if you don’t participate you are fined for not paying your tax. “If you like your doctor, you’re going to be able to keep your doctor. If you like your plan, keep your plan.” Barack Obama March 19, 2010. That may have been true before HHS, under his dictum, stepped in and made ridiculous demands on insurers to have 50 year-old males pay for birth control, maternity care and mammograms and 18 year-old girls pay for prostate cancer screenings. “Our current best assessment, based on the information that we have at present, is that, in fact, what this began as, it was a spontaneous – not a premeditated – response to what had transpired in Cairo. In Cairo, as you know, a few hours earlier, there was a violent protest that was undertaken in reaction to this very offensive video that was disseminated.” Susan Rice on This Week. “What difference, at this point, does it make?” Hillary Clinton at Senate committee hearing 1-27-13. Radical Muslims (non-existent in Janet Napolitano’s or Jeh Johnson’s world) routinely carrying rocket launchers in their back pockets got pissed because of a Youtube video. Yeah, right! If this isn’t Orwell’s New Speak, what is?